Catlike “mew.” Clear whistled song begins with “weet-chur” and ends in raspy trill. Description: Sexes similar. 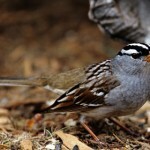 Greenish-olive back, wings, and rump, darker tail; reddish crown; distinct white throat bordered by dark and white stripes; white lores; grayish face and underparts; white belly. 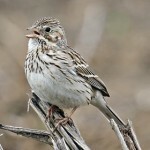 Juvenile is streaked brown overall with two faint olive wing bars; lacks reddish crown. Behavior: Usually sings from atop a shrub or young conifer. Erects reddish crown into a crest. Habitat: Migrants found in thickets and dense shrubbery in arid habitats. Also occur in sagebrush-covered plains. 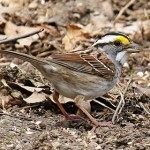 Where in Nebraska: Uncommon but regular spring and fall migrant in western Nebraska. Mostly seen in Panhandle, but recorded east to McPherson, Logan, and Lancaster Counties. 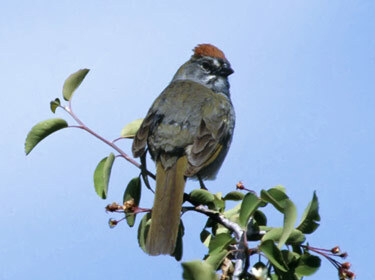 Fun Facts: Green-tailed Towhees are the smallest and only entirely migratory bird of all the towhees.